A community of entrepreneurs, developers, designers, professionals and... anyone who wants to build a network of tech enthusiasts within the Trento area, with the purpose of learning and sharing new ideas regarding development, design, entrepreneurship, startups and any related topic. 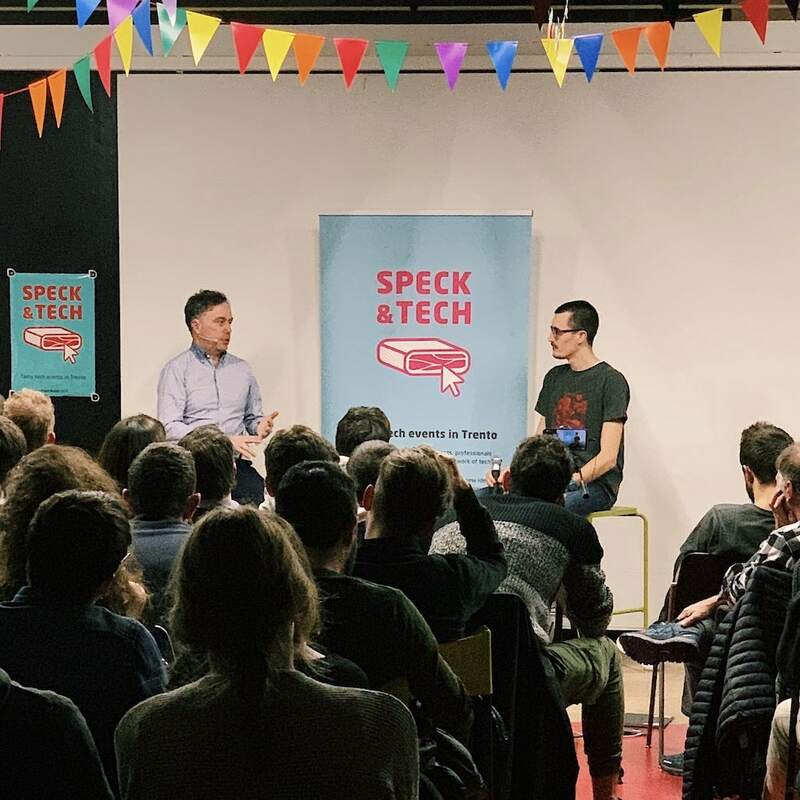 Would you like to sponsor Speck&Tech? Do you wanna be our next speaker? OpenMove stems from the idea of bringing mobility closer to people, providing information and easy access to transport services. Our software solutions now empower more than 6M people to move every single year. OpenMove is a fast-growing company with a strong mission and vast ambitions. The people in our team are the most important company asset: we believe that the intellectual property of a company lies between the ears of its members. Growing, and doing it in a sustainable way, is an ever-present objective for OpenMove that we pursue by investing in ourselves and our products, with a genuine passion for innovation. We are hiring new colleagues because we have a challenging plan to grow and do new amazing things and we need help to accomplish it. Our mission is demanding but lived with enthusiasm. We want to put ourselves in the best possible working conditions, building a dynamic and stimulating work environment where we value everyone’s ideas. You will work on concrete projects that will have an impact on people’s lives and that will make you grow personally and professionally. We offer a comfortable workplace, IT working tools in step with the times, free food, drinks, coffee and meal vouchers. We organize moments of personal and group training, also thanks to company retreats in the mountains. The location is in Rovereto (TN), easily reachable both by car and by public transport. We are looking for highly skilled software developers. We offer a full-time position with open-ended contract. You will work with our technical team and commit to the development, deployment and maintenance of our software solutions for smart mobility. You will work in a team with agile methodology. Our product is very extensive: you will work on every aspect with the technical team and you will be able to learn a lot of new things. An important component of your work will be the design of full-stack systems, the optimization of processes and the scouting of new technologies. Sometimes, your contribution in the analysis of technical documentation, in the drafting of technical-commercial offers and in project documentation will be precious. DIMENSION è una società che da più di 15 anni si occupa di sviluppo mobile, ricerca in ambito AI/NLP e Blockchain, progetti nel settore fintech, health, turismo e cultura. Lavoriamo per startup e grandi società, aiutandoli a realizzare prodotti e servizi in grado di sostenere le differenti esigenze di business. Stiamo cercando una sviluppatrice o sviluppatore software per il nostro team mobile. Lavorerai su progetti molto complessi dove imparare cose che in pochi sanno fare. Siamo un team di 15 persome, uomini e donne, dove la collaborazione e le contaminazioni sono super-importanti. Devi avere una comprensione lavorativa della lingua inglese, sufficiente ad ascoltare un TED Talk o arrangiarti su StackOverflow senza usare (troppo) il traduttore di Google. Pari opportunità se provieni da qualsaisi angolo del mondo, per età, religione o sesso, ma abbiamo bisogno che tu sappia scrivere e leggere anche in Italiano. Ti piace cucinare, fare sollevamento pesi, binge watching su Netflix, giocare con i Lego assieme a tuo figlio? Anche a noi! Il nostro obiettivo è costruire un ambiente che permetta sempre di bilanciare al meglio lavoro e vita privata. Ma la persona che cerchiamo è appassionata di tecnologia, si informa nei ritagli di tempo e ha le idee migliori canticchiando sotto la doccia. La retribuzione sarà concordata in base alle tue capacità e ambizioni. La durata iniziale, per conoscerci, è di 6 mesi, ma la prospettiva è quella di costruire prodotti e servizi innovativi e rilevanti per i prossimi 10 anni. Il tuo contributo sarà fondamentale per raggiungere assieme questi risultati! Abbiamo un ufficio spazioso e confortevole nel centro storico di Trento, favoriamo gli spostamenti con i mezzi pubblici, aiutiamo chi arriva da lontano. Dedichiamo il 10% del nostro tempo alla sperimentazione: vuoi realizzare un videogioco? Programmare un robot? Sperimentare su un computer quantico? Se convincerai 4 colleghi sarete pagati e vi forniremo tutto il necessario per farlo! Ti metteremo a disposizione il miglior hardware disponibile sul mercato per sviluppare. Siamo in costante crescita, abbiamo sempre premiato il lavoro del nostro team! Se sei interessato scrivi a [email protected] e raccontaci brevemente cosa sai fare o perchè sei interessato a questo lavoro! XPeppers (a Claranet company) is a software development company that helps its customers to build innovative digital solutions and reduce the overall time to market by combining Agile, Lean, and DevOps practices along with Cloud-based infrastructures. Our team strives for quality software and technical excellence while working closely with customers to gain an insightful understanding of business objectives and scope. We strongly believe in an iterative-incremental approach to gather feedback and catch possible misunderstandings early. This year XPeppers joined the Claranet Group which has an international reach and will enable many exciting challenges to come. Available positions in all of our headquarters (Trento, Milan, Rome, and Lugano) within self-organized teams with a strong focus on work-pace sustainability. Our teams make use of time management techniques such as the pomodoro technique to alternate productive sessions and energizing breaks. Continuous improvement is part of our DNA and that’s why we dedicate at least half an hour every day to study topics that allow us to grow. We also offer a budget for training materials such as books or online courses, workshops and conferences. We look for passionate people that believe in our values and are willing to learn and share experiences in a welcoming environment. If you think you’d be a good fit don't hesitate to get in touch on our website. For all the students: we will also be present at Career Fair on April 3rd, come talk to us! Check out the the open positions!